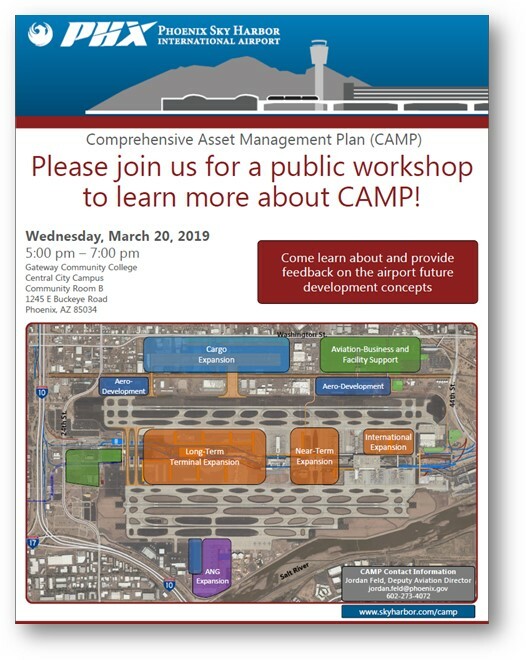 Phoenix Sky Harbor International Airport (PHX) is holding a public workshop for its Comprehensive Asset Management Plan (CAMP). The PHX CAMP is a 20-year plan for airport facilities, infrastructure and land development. Please join us on Wednesday, June 13 from 5:30 PM until 7:30 PM at Gateway Community College, Central City Camps, Community Room B and be involved in the development of this plan. Please see attached fliers for full workshop details and for more information on the PHX CAMP please visit skyharbor.com/CAMP. Feel free to share the fliers with you families, neighbors and friends, or to print and post them to spread the word.